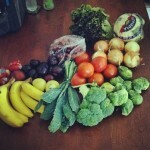 Bountiful Baskets is a food co-op. It is all volunteer based which is how they keep the prices so low. You can order your basket of produce on line and pick it up at a designated location and time every other Saturday morning. The baskets are generally half fruit and half veggie. Most items are common but sometimes produce is included that you might not normally buy which is part of the fun! By visiting, http://bountifulbaskets.org/, you can order online and view several locations throughout the Treasure Valley to pick up your basket of produce. Pretty cool right?! I know I will be joining the Bountiful Basket craze this year!